the wreath stamp with the heart in the center is a perfect valentine - love it! 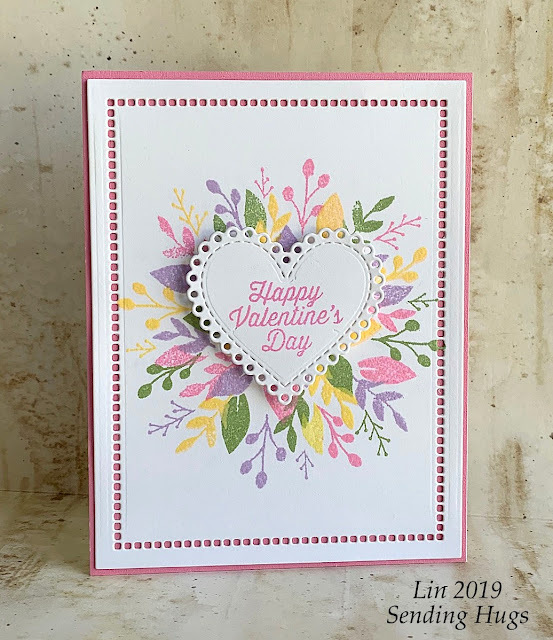 Yes, I love the hemstitch die, too, Lin! And, your wreath is everything spring should be with those soft colors. Wonderful - I love the flowers so much. Lin what a lovely combination of that heart over the c&9th turnabout. Stunning-no one does pastels like you. I love all the dies that make a card look just a bit different. Such a sweet card! This is so pretty and feminine! so very pretty Lin. The die is really a pretty frame. This is lovely, Lyn! I really like the hemstitch and the turnabout -- now I really want both! Love the color scheme you chose too.